Another layout to share with you today. Not much went on mid-March, so I managed to fit anything important for these few weeks in just 2 pages. I also wanted to keep Austin's birthday a separate spread, so I stopped at March 27. I used my Breathe In digital kit for this layout, along with my new templates, which you can find here and here in my shop. 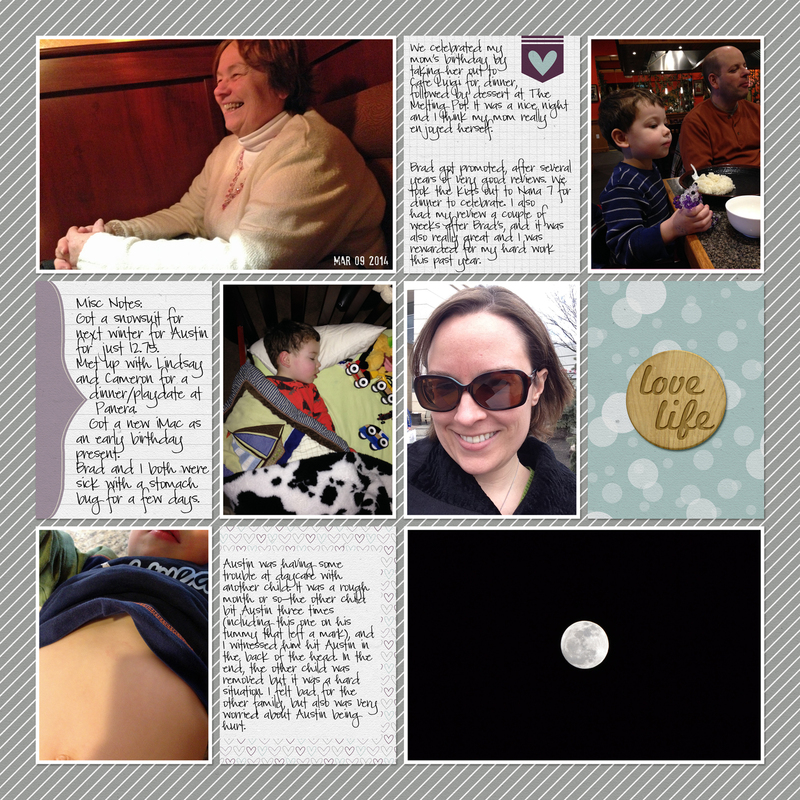 On this page I included my mom's birthday, Brad's promotion, an issue we were having with daycare, and a shot I took of the moon one evening. This page uses my newest template (linked above). I'm just creating templates as I feel I need them, so you should see more as the weeks go forward. This journaling card is reversed. 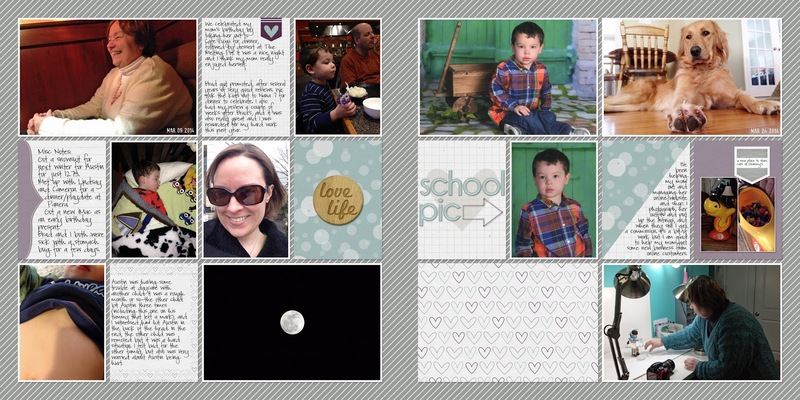 Sometimes the orientation of a journaling card doesn't quite work in a layout. You can flip it pretty easily. In Photoshop Elements, just go to Image-Rotate-Flip Layer Horizontally (or Vertically, or you can do both). So simple. 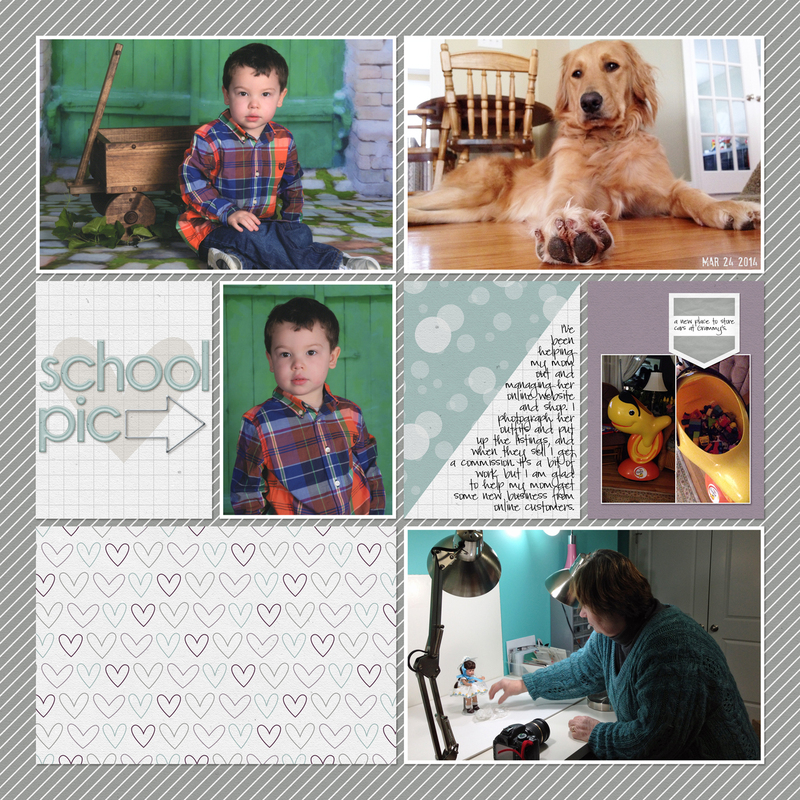 I didn't have many photos for the later part of this spread, so I just added in Austin's school pictures which I received during that time, a photo of Sadie when I was home sick, and one of my mom during one of our photo sessions for her online website. Once again I flipped my journaling card (the one with the green triangle) around to the orientation I needed. 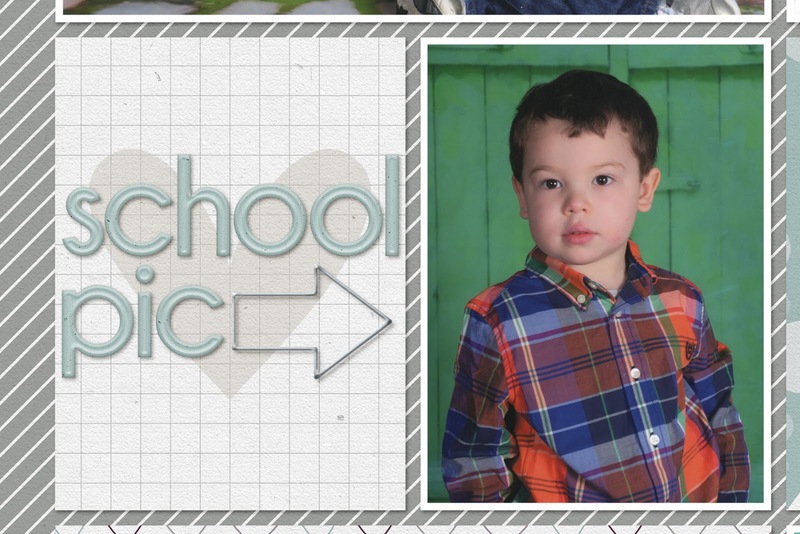 I used the alphas from the kit and the arrow paperclip embellishment over one of the journaling cards to point to his school photo. This layout came together pretty quickly - did the entire thing during one of Austin's naps. So, how are things going with you guys? Hi there! I can't believe it's taken me this long to find your blog - I did, however, take about a year (or more!) off from scrapbooking and am just now getting back into it. 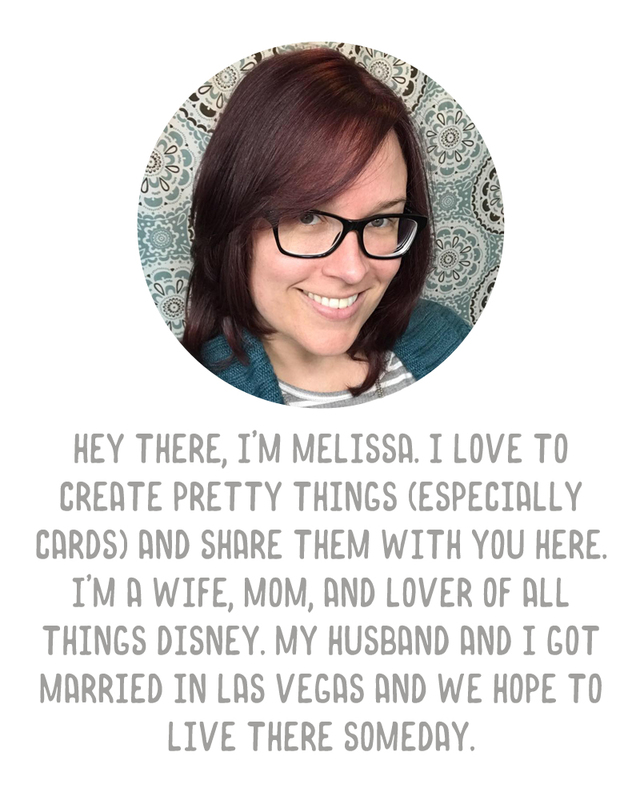 Your pages are amazing and you are very inspiring! I also wanted to point out - I live in Massachusetts as well! (I recognized SANTA, that's how I knew you had to be from here!) :) Thanks so much for all your creativity - cheers! Oh that's too funny. We live in a nearby town from Burlington...are you in that area as well?